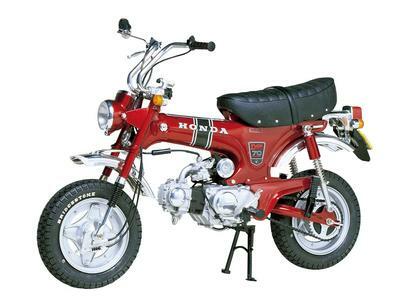 The Honda Dax (also known as the ST70) was a mini-bike which featured a distinctive frame shape. The Dax bike sought to continue where the earlier Honda Monkey left off, offering riders both the enjoyable leisure riding that made the Monkey such a popular bike as well as an increased level of practicality for everyday use. The Dax featured a T-bone shaped pressed steel frame with the fuel tank mounted internally, resulting in its characteristic look. •	1/6 scale plastic model assembly kit. Length: 250mm. •	The T-bone frame is depicted with accuracy, complete with internal gas tank and battery case. •	Features sprung folding main stand and brake pedal. •	Semi-pneumatic tires are given a realistic tread pattern, and have Bridgestone lettering. •	Features a removable front fork section and folding handlebars, just like those on the real bike. •	Rear seat is opened via a lever on the model. •	OHC engine is recreated in great detail, including depictions of cooling fins. •	With authentic metal plated matte wheels, and gloss components for muffler, handlebars, fenders and more. •	Rubber tubing is included to recreate the various pipes and lines on the bike. •	Comes with high quality Cartograf decals. Special Feature 1 Movable front and rear suspensions feature realistic metal damper springs. Special Feature 2 Distinctive T-bone frame. Special Feature 3 Vinyl tubing to reproduce the various cords and wires. 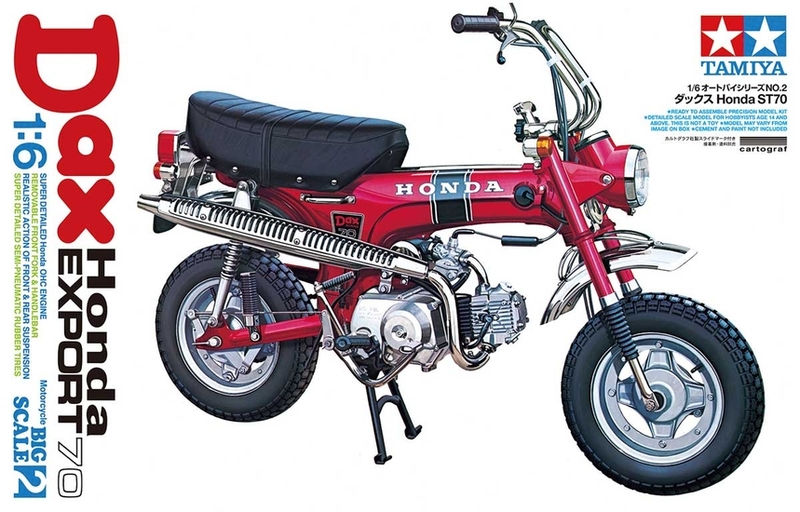 Special Feature 4 High-quality Cartograf decals to depict either a 50cc engine version or a 70cc engine version.